Altered was nothing like I'd expected it to be--it was way better! When I started out reading it, I was a bit wary, because the perspectives jump between characters rather quickly, which confused me as to who was who for a while. But eventually, I got the hang of it, and the story started getting extremely interesting. It's set in a school that is supposed to be a sort of reform school for kids that no one else wants, or kids that would have gone to jail. But all then, as we read on, we see kids being punished in very unorthodox ways--being tied down to a metal table and electrocuted to the point where it burned their skin, sleep deprivation, food deprivation, and then eventually having permanent shock wires placed on the kids, so that the teachers could shock them whenever they wanted. It was pretty sick what was going on, and sicker still that the teachers thought they were doing something good by torturing the children. Honestly, you don't 'cure' bad behavior with more bad behavior. It's like beating a dog over and over again; it might be submissive for some time, but one day it will have had enough, and it's going to turn around and bite your damn hand off. I was on edge the entire time I read Altered. I kept wanting to just jump in the book and tear the school down until not a brick was left standing, that's how intense it was. One thing that did bother me though was towards the end, it mentioned that some of the characters were 14 years old, and that didn't really sit well with me considering some of what they did, and how they acted. I think it would have been better if they were older, especially one scene in particular that kinda made me cringe when I thought about how young they were. But the way they were written was really interesting, because they spoke pretty accurately for a lot of teenagers today, and that made them feel real. I definitely recommend Altered to anyone looking for a really intense novel, and one that has constant action and suspense. I give it 4 out of 5 stars. 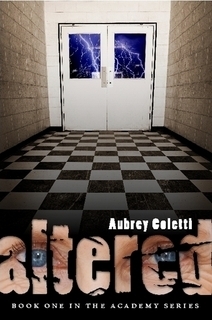 I have 1 paperback copy of Altered to give away! If you're interested in reading it, then definitely enter the giveaway below! Idk if i would rebel or not just because im the shy type so who knows what i would do. I would have to do something, but I would sure be scared to start it. I would definitely stand up for myself and my friends!